I'd like to say it's from our garden but not yet. However we did buy a small one to sprout and PUT in our garden for next year. 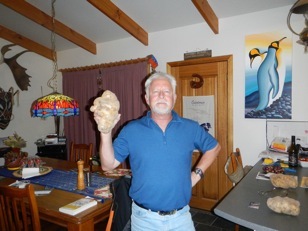 Check it out - it's locally grown and as big as his HEAD! It's called a snowflake potato and it made the most outstanding french fries. Fluffy and moist inside, and crispy outside. Mmmmmmm.